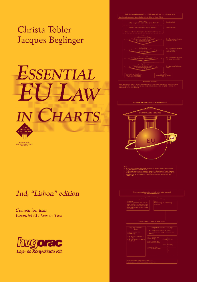 Web-Companion "Essential EU Law in Charts - Reprints"
Dear Reader of "Essential EU Law in Charts, 2nd Lisbon edition, 2010, <...> Reprint". Please take note of the following updates and corrigenda. Please consider that this book has seen several reprints, which brought about minor updates with each reprint. It may therefore occur that updates or corrigenda are listed which may already have been taken care of in your printed copy. It would appear that in some copies of the charts book (2nd edition, First Reprint), due to a print shop error, some boxes are simply black (i.e. no text is visible). The correct version can be downloaded here.